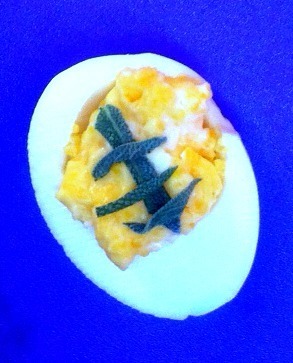 This fun football themed twist on your basic devilled egg is just perfect for a tailgating or homegating party! You can use some fresh herbs like I did here to create the stripes or try tiny slivers of pickles, the green parts of green onions, or chives. 1) Hard boil 6 eggs as usual. Cut them in half and carefully scoop out the yolks. Mash them up with 2 T. mayonnaise, 1 tsp. mustard (I love a grainy one in this), 1 tsp. Worcestershire sauce, 1 tsp. white wine or balsamic vinegar, 1/4 tsp paprika, the juice of 1/2 lemon, and a little salt and pepper if desired. Now you can either mix in about 1/4 cup sour cream OR beat 1/4 cup heavy cream until it forms soft peaks and fold that in. YUM YUM! 2) Want something with a bit more kick? Try this variation. Hard boil 6 eggs as usual. Cut them in half and carefully scoop out the yolks. Mash them up with 3 T. kimchi, 3 pieces of bacon that have been cooked until crisp and crumbled, 3 mint leaves, chopped, and 3 T. mayonnaise. Divine! Add your garnish to each of the eggs using whatever you’ve decided as the stripes and serve. Be sure to check out all the other projects in this series for more ideas for your tailgating party! I love deviled eggs and these are cute. SO creative! We love deviled eggs in our house and they’re a staple at our football parties. Gonna have to try these!